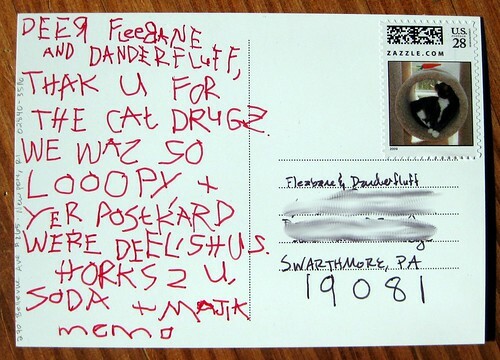 Remember that wonderful catnip postcard for my cats from the gorgeously-named Fleabane and Danderfluff? Yeah, I thought so... it's pretty unforgettable. I made my kitties write a thank-you note for such a gift, of course. 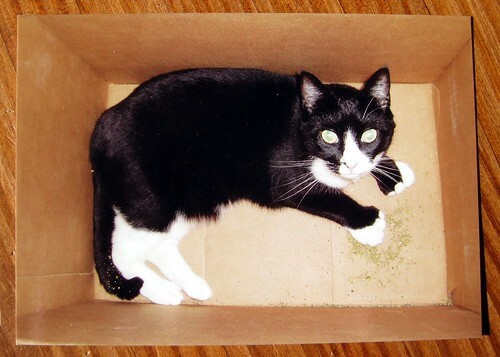 I thought that this moo.com postcard of Soda playing in a catnip-filled box (in her younger years, I grant you) was a perfect vehicle for such a note. Soda has written notes before, she is the most literate of my three cats (perhaps owing to her habit of helping me with so many letters of my own). Please ignore her backwards letters and spelling mistakes - she does her best, and all things considered (like the lack of opposable thumbs), I'm pretty darn proud of her. And in the Soda lexicon, "Horks 2 U" is high praise indeed. And yes, that is indeed my tabby cat Magic on the stamp, staring up at an orange catnip carrot. Nice picture of your lovely Soda! Pretty good for no thumbs. My dog just got into my stuff and sent my wife a Valentine's Day card, and her handwriting's not bad either. Good thing you had stamps with Magic's picture on them. I don't know about cats, but my dog, not understanding money, just chose a stamp with a picture of Lassie. 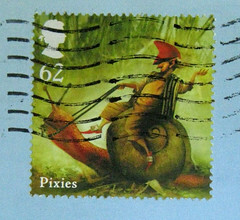 Fortunately it was enough postage. That's the cutest thank-you ever. E! Look at those thumbs!!! Ahaha, I love it :D Once my boyfriend read about a cat who was given paint and a canvas and 'painted' a picture that sold for thousands of dollars, so he set up some paint for our cats and we now have three very abstract paintings in our lounge room made by our cats. Very Pollock. Bianca, your comment reminds me that Soda once had an unintended stint as an artist herself... Many years and many households ago, when Soda was still but a kitten, one of my housemates left her palette of oil paints (the very toxic kind) on a chair that Soda often slept on. Soda didn't see the palette and jumped up on the chair, and landed right smack in the middle of all the oil paints. She jumped off, tracked oil paint all over the couch and part of that room, and fortunately I was in the next room with two other housemates. They helped me grab her, we paid way too much money to the pet poison hotline to ask about the toxicity (because of course this was a Sunday afternoon when nothing was open), and were told we mustn't, mustn't, MUSTN'T under any circumstances let her lick the paint off her paws herself, which she was desperate to do. An extensive session in the kitchen sink, with GOOP cleaner and a VERY wet Soda, ensued. I will never forget that afternoon. Oy!